This large capacity multideck provides an excellent presentation for any product put on display. Thanks to extensive options of cabinet configurations and accessories, Jupiter is an ideal solution for each store type and for each product range. Balanced cool air circulation between the shelves ensure perfect preservation of merchandise. Its powder coated, zinc plated metal (1.4 mm thickness) construction serves as a guaranty for durability. Dual air curtains help save energy. Can be ordered as an open version for a high sales turnover or with glass doors focusing on energy efficiency. Night blinds available for reduced energy consumption. The cabinet is multiplexable, can be joined into rows or form a separate island. Katalogové č.: Jupiter Roll-In Jupiter Roll-In offers high floor space utilization. 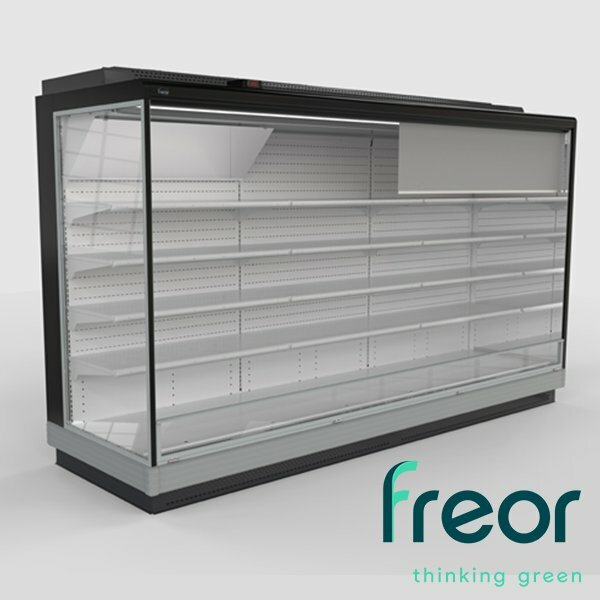 This refrigerated multideck modification has a large capacity and is able to accommodate huge loads. Its liftable front panel allows quick and easy stocking of products when on trolleys or euro pallets. It serves as a perfect solution for the display of goods that undergo frequent rotation, so it saves a lot of your time.